Based on secondary market activity, the average price to all games in the New York Rangers vs. New Jersey Devils series exceeds $275, with tickets to see games in Madison Square Garden running at a nearly $140 premium over series games at the Prudential Center in Newark. 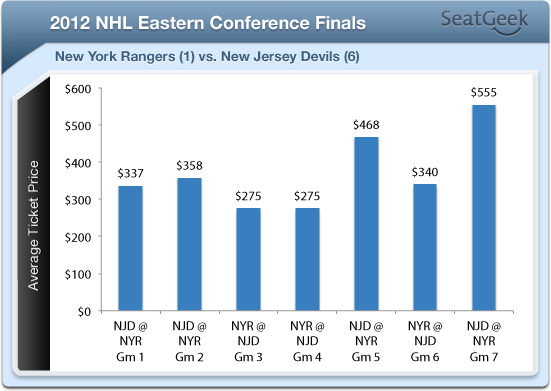 On average, a playoff ticket to see a Rangers home game in this series has cost fans $426 on average, whereas the average price paid for a Devils home game ticket has been only $285. Looking at individual games, the least expensive Rangers game of the series will likely be tonight’s Game 1, for which tickets are selling for $337 on average. Prices only go up as the series goes on, as Game 2 tickets are currently averaging $357 on secondary markets, while Games 5 ($467 average) and Games 7 ($555 average) will be even more costly if they do occur. Across the Hudson, individual game ticket prices are slightly more affordable, yet still in the high $200 range. Tickets Game 3 and Game 4 of the series have cost fans $275 on average on secondary markets, with Game 6 tickets rising to $340. Even after throwing in a $4 round-trip PATH ticket or a $12 toll for the Holland Tunnel, hockey fans living in New York can save some substantial cash by attending Eastern Conference Finals games in Newark rather than at MSG. In terms of fan interest by geography, as you might expect, more fans from New York are shopping for tickets to the first 2 games of the series at MSG. 56% of ticket shoppers for Games 1 and 2 hail from New York state, while 27% of shoppers to those games hail from New Jersey. Meanwhile, Game 3 and 4 have seen New Jersey shoppers outnumber those from New York, though by a much narrower margin. 47% of shoppers for tickets to those games hail from New Jersey, with 40% originating from New York state. In terms of best deals out there – the absolute least expensive ticket to any of these first 4 games is in fact for tonight’s Game 1 at MSG, as $177 will get you a seat in Section 412 of the Garden. But if you want to sit on the glass tonight, a ticket in Row AA at MSG will cost you at least $883. Meanwhile, over in Newark the cheapest tickets can be found for Game 4, with the least expensive ticket currently on secondary markets a $213 ticket in Section 120. A seat on the glass for Game 4 will run you $636. As for how prices may move in the coming days — prices for these first 4 games should drop as we near closer to gametime and the series begins to take form, but if the series is close and looks likely to stretch to perhaps 6 or 7 games, expect prices for those “if necessary” games to climb rapidly as a berth in the Stanley Cup Finals–or conversely, elimination–is on the line. Particularly with prices for the two “if necessary” MSG games already in the $400-$500 range, we could easily see the most expensive NHL tickets of the year in this series.